1. In a large bowl, mix the pretzels, margarine, and sugar. Spread this mixture in a 9-inch pie plate. Press the mixture onto the bottom and sides of the plate. Refrigerate. 2. In a large bowl, mix the condensed milk, strawberries, and lime juice until well blended. Gently stir in the whipped topping. 3. Pour the strawberry mixture into the refrigerated crust. 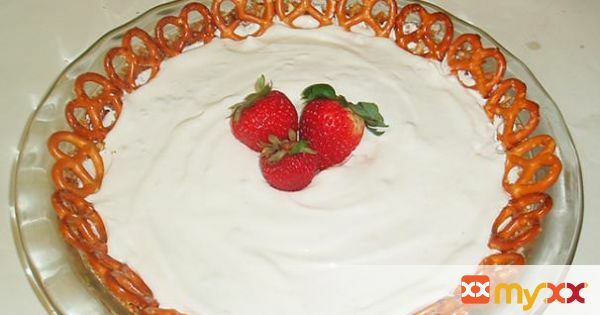 Garnish the pie with additional whipped topping, strawberries, or pretzels if desired. 4. Freeze until firm, about 6 hours. Let the pie stand at room temperature for 15 minutes, or until it can be easily sliced. 5. For easy serving: dip the pie plate into warm water, just to below the rim, for 30 seconds. Store leftover pie in the freezer.